Their larvae are Yellow to light brown, 3/8 in. long. While the adults are small moth, 1/2 in wingspread; reddish brown with silver gray markings. Most pines are their hosts, 2-3 needle pines (longleaf and slash) have some resistance. Dry weather, poor soil conditions and poor stands all contribute to infestations. The tips of terminals and laterals killed by larvae boring deep into base of needles, buds, and then into twigs. 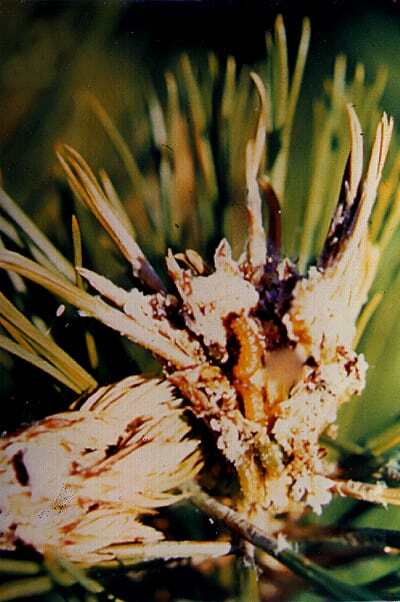 Some pines may be killed back to a foot below terminal or lateral growth. Young pines can be seriously deformed and occasionally die. They overwintering pupae in damaged terminals and laterals and in litter on the ground. Usually in early April, moths emerge and continue emerging until June. Moths lay eggs on needles, buds, and shoots of new growth. Egg incubation period ranges from 1-3 weeks, depending on weather and temperature. Newly hatched larvae feed on surface of new growth and later migrate to shoot tips, make a web, and bore into bud and stem tissues, where they feed 3-4 weeks. Pupation is in channels made by larvae. For example, there are 1-4 generations per year: One (1) in New York; Pennsylvania, 2; Virginia, 3; Georgia and California.